Dairy Money Matters book consolidates 25 years of advice from columnist Gary Sipiorski to create an approachable “survival guide” for financial decision making. Financial awareness is as critical a “leg” to the dairy industry as cow comfort, feed and nutrition, and healthy working relationships. Gary Sipiorski has set out over the last 25 years in his Money Matters column in Hoard’s Dairyman to provide bite-sized lessons and guidance with just that mission in mind. 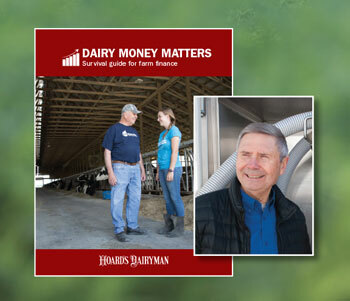 Now, you can find all of his advice combined into a single book titled Dairy Money Matters that is available through the Hoard’s Dairyman online bookstore, www.hoards.com/bookstore. Throughout his career, from his work in the feed industry at Ralston Purina (Purina Mills) to working his way from agricultural loan officer to president and CEO of Citizens State Bank of Loyal, Sipiorski has been actively involved in Wisconsin’s rural economic development. Gary now works directly with dairy farmers through his dairy development manager role at Vita Plus, as well as developing financial training tools for the Professional Dairy Producers of Wisconsin (PDPW). Readers of his column and leaders in the finance industry have expressed gratitude and acclamation for Sipiorski’s new book. The Hoard’s Dairyman bookstore traces its roots back to the early 1900s in providing helpful and meaningful resources for any and all involved in the dairy industry – farm managers and employees, veterinarians, students, and industry professionals alike. Topics of coverage range from academic resources to gift purchases and youth guides. Learn more about the bookstore and its offerings at www.hoards.com/bookstore. Visit on.hoards.com/MM18 for a preview of the book and more details. For more information on the Hoard’s Dairyman online bookstore, visit www.hoards.com/bookstore, call Aisha Liebenow at (920) 563-5551, or email hdbooks@hoards.com.